If you are looking for home remedies for dog cataracts, most likely your dog is already suffering from the aftermath of this frustrating eye condition. Cataracts in dogs can be annoying as cataracts in people causing cloudy eyes and potential visual impairment long term. Cataracts can also lead to serious complications that can result in blindness. Yet, mild cataracts in dogs may not be as debilitating as in people as dogs are not required to pass eye exams to keep driving nor are they in need of using their eyes for close needlework or for reading. On top of that, dogs have a great ability in compensating any impaired vision with their other keen senses. It’s always helpful for dog owners learning more about the condition that is affecting their dogs. This puts dog owners in a position of being better able to understand and care for their affected dogs. Knowledge is ultimately power. Cataracts is a problem that affects the lens of the dog’s eyes. In a dog with healthy eyes, their lens are composed by thousands of small fibers that resemble tiny, transparent tubes. In order for lens to work well as they should, the tiny fibers need to be lined up rather neatly and straight as this allows light to pass through the dog’s lens and then reach the back of the dog’s eye which is where the dog’s optic nerve is located. 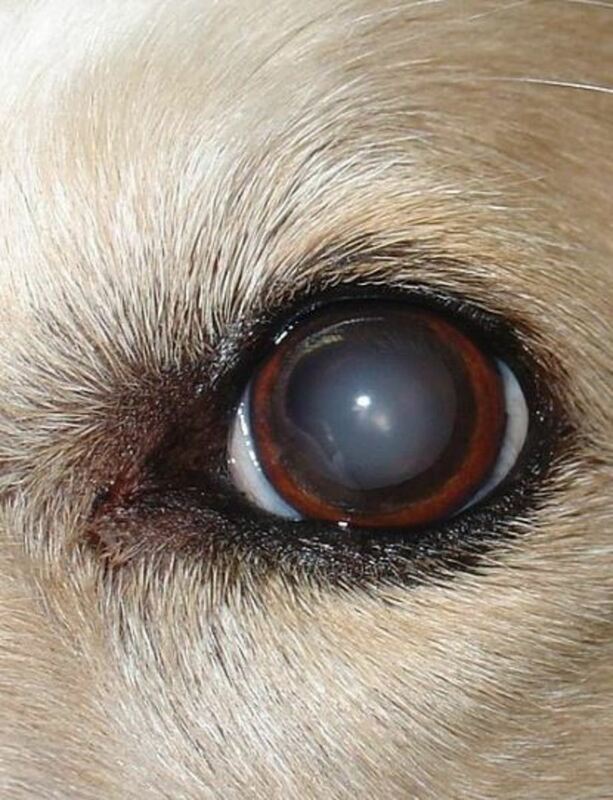 In a dog suffering from cataracts though, a glob of broken proteins stuck together cause the small fibers to become damaged and no longer lined up straight, and this causes light to bounce off of them rather than passing through the lens. This causes opacity of the lens, since light is no longer able to reach the back of the dog’s eye. Cataracts in dogs can be an inherited condition, or it can be acquired as a result of diabetes, trauma, severe nutritional deficiencies, exposure to toxins or simply as a result of aging. Left untreated, cataract can cause serious complications such as secondary glaucoma or uveitis, a severe inflammatory condition. Cataracts can ultimately lead to blindness. Because as we have seen, cataracts in dogs is a medical condition consisting in the misalignment of the lens’ fibers, there is unfortunately really no totally effective home remedy to make this condition magically disappear. To realign these fibers, as of today, the only treatment is surgery. However, there are several home remedies for dog cataracts that can help make the condition more manageable. What happens with lenticular sclerosis is that, as dogs start aging the fibers in the dog’s lens get denser, hardening or drying out, and this causes them to reflect light differently, making the pupils appear hazy and softly white in color. Lenticular sclerosis typically affects both of the dog’s eyes. If your dog’s eyes seem to be getting hazy, it’ important to see the vet for proper diagnosis. While lenticular sclerosis can make the dog’s vision a little blurry, unlike cataracts it does not cause blindness, explains veterinarian Dr. Rebecca. If your dog has cataracts and it’s confirmed by the vet, now is definitely not the time to do big time remodeling and re-arranging furniture around. A dog with cataracts might not see as well as before and therefore the dog relies on his memory to prevent himself from bumping into furniture. You also want to avoid grooming that entails cutting off a good part of your dog’s whiskers. Whiskers in dogs work as little antennas that receive information about the dog’s environment when they rub against objects. This information is transmitted to the dog’s brain through sensory nerves found in the dog’s hair follicles. Whiskers therefore help dogs navigate when it’s dark or when they no longer see well. It would be really wonderful if there was such a thing as home remedies for dog cataracts such as eye drops that melt away a dog’s cataracts and restore the dog’s vision. While dog cataract eye drops that heal the dog’s eyes has still to be invented, a product known as C-Bright has been showing some promising results in lubricating and protecting the dog’s eye from dryness and irritation. Another product known as Ethos Bright Eye makes some promising claims, but many dog owners report that the treatment with these eye drops turn out being costly, considering that the product needs to be re-ordered quite frequently as bottles don’t last long. Some dog owners claim that the treatment long term can turn out being quite costly with no certainty of the dog’s eye getting better; whereas surgery for cataracts has high success rates and will almost end up costing the same. Surgery for dog cataracts costs anywhere between $1500 to $2500 per eye. As to effectiveness, veterinarian Dr. Louis Gotthelf claims that there is some evidence that a product like Can See eye drops may help if the dog is at the very early stages of a cataract, at least preventing the growth of more cataract tissue, but hopes should not be kept high as a product as such will not work to dissolve a cataract.